Heat oven to 400°F. Spray 13x9-inch pan with cooking spray. In 10-inch skillet, melt butter over medium heat. Add mushrooms and onions; cook about 5 minutes, stirring occasionally, until onion is tender. Drain. 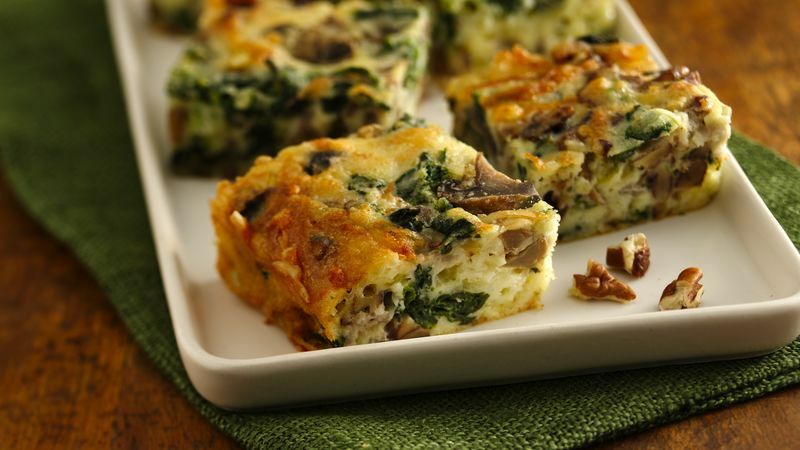 In pan, mix mushroom mixture, cheese, pecans and spinach; spread evenly. In medium bowl, stir all remaining ingredients with whisk or fork until blended. Pour into pan. Bake 25 to 30 minutes or until knife inserted in center comes out clean. Cool 30 minutes before serving. Place the thawed spinach between several layers of paper towels. Then roll and squeeze the paper towels to remove excess moisture from the spinach.